Today's Prompt: Wikipedia. Pretend you’re rewriting or adding onto your condition’s page – what sentence or paragraph should be included (in your opinion) on your the page. 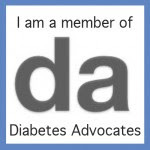 Ok, first of all, I must say that I am quite impressed with what's there when you search for diabetes. It has seperate sections on Type 1 and Type 2. Woohoo! And it even mentions LADA (although that section could stand to be expanded upon). This line is both exciting and frustrating: "Both type 1 and 2 are chronic conditions that usually cannot be cured." Yay for someone entering that BOTH types usually cannot be cured! Woot! Now the word "usually" needs to be removed, and we'll be good to go. Both type 1 and type 2 are chronic conditions that cannot be cured.